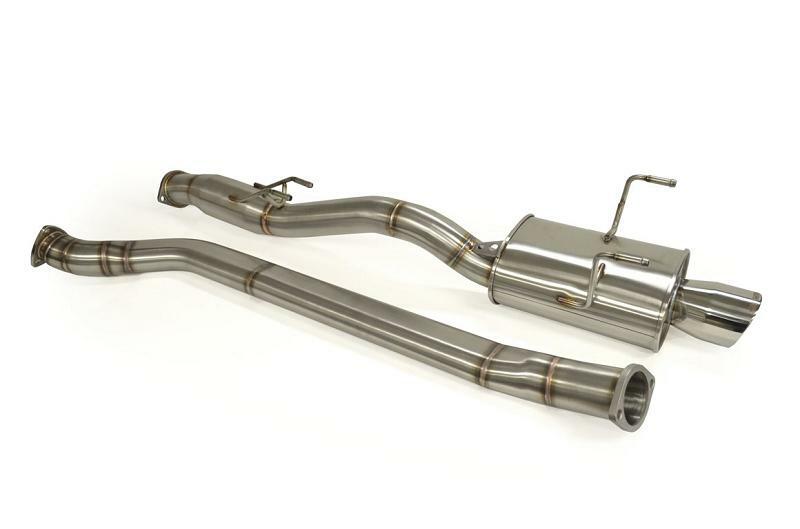 K-Tuned Oval Tube Cat-Back Exhaust Systems have been developed to offer maximum overall performance and excellent fitment, something that until now has been quite difficult to accomplish. We already know that 3” piping reduces restriction and offers the K engine significant power gains, especially in the higher rpm range. The problem with larger diameter exhaust systems has been fitment because standard 3” round piping under the chassis hangs way too close to the ground. The key feature of the K-Tuned Oval Tube Cat-Back Exhaust is the uniquely designed oval tubing mid pipe, which solves the ground clearance problem and maximizes exhaust flow. There shouldn’t be anymore scraping on driveways or speed bumps because the 3” nominal size oval mid pipe actually hangs at the exact same height as the factory exhaust. The system is a direct bolt-on using or switching to an RSX Type-S header. The muffler enters at an offset to ensure it will clear the rear swaybar. Note that the entry to the mid pipe has an extremely short section of 2.5” pipe that quickly steps back up to 3”. This is necessary because we wanted our system to bolt up perfectly to a stock RSX Type-S header as well as any aftermarket headers that maintain the RSX-S factory connection point. If you have a turbo setup or an aggressive all motor setup you can easily cut this transition off and join it to your down-pipe or header. The over axle section includes a resonator and fully polished stainless steel muffler with double wall slash cut tip. All hardware and gaskets are included. Last, for anyone who has questions about sound keep in mind that this is an aggressive, race-inspired, straight through exhaust system so it will make some noise.